or releasing dark forces under her control. like some governess ruling an unruly child. Wildness which she constrains to yield. as she shapes the jaws of her rampant beast. A.E. 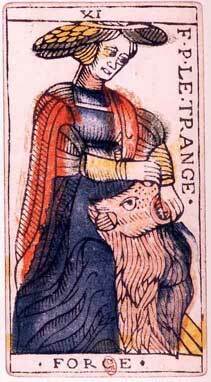 Waite calls the card 'Strength' and places it as number eight in the sequence, interchanging it with 'Justice'.